Amy's Creative Pursuits: Wink Wink Ink's 1st Birthday! Hello! 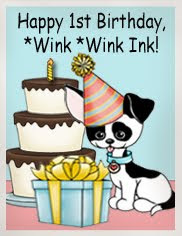 I'm excited to announce that today, the first day of the New Year, is Wink Wink Ink's 1st Birthday! And in honor of this day, Melanie, the designer and owner of Wink Wink Ink decided to throw a birthday party and she asked all her designers to create a card or project using images from her 'Birthday Necessities' set. This is a great digital set that includes any image you can imagine to make a birthday card or scrap book page. It has images of a cake, present, balloons, sentiments, candles, and numbers all in one set. The images in this set can also be used with other Wink Wink Ink digital images too, so any Wink Wink image can quickly and easily be turned into a birthday card. I decided to use the Present and Cake image to make my card. First I created my own background paper by duplicating the present image a multiple number of times and then coloring it in. Then I added the cake image as my main focal image. I covered the frosting with pink glitter, and added tiny pearls to the cake. The sentiment is also in the Wink Wink Ink set, I used a Cuttlebug Die to make the tag. 2. Display it on your blog sidebar and link back to Wink Wink Ink until the end of January. Thats it! You don't even have to make a card to qualify! And please stop back often at the Wink Wink Ink blog. There just might be more Birthday Party Fun in store for you throughout the month. Your card is spectacular and that cake looks YUMMY!! Oooo, please save me a piece! HAPPY NEW YEAR my friend! May 2011 be the best ever for you & your family! Hi Amy what a gorgeous and delicious looking card that cake looks fabulous and the bp is so lovely. Amy your card is very sweet!! Happy New Year!! This is perfect for a birthday.. I love all the pearls and glitter.. Great card Amy.. Hope you had a super holiday and a blessed new year. Wow, Amy this is amazing! Love the sparkles and pearls on that cake. Fabulous sketch and what a great idea to make your own designer paper! What a sweet card Amy, I love the glittery icing and the pearls are the icing on the cake . . .way too cute! Happy Birthday to winkwinkink! Your card is adorable! I like your cake decoration. Very cute bday card.